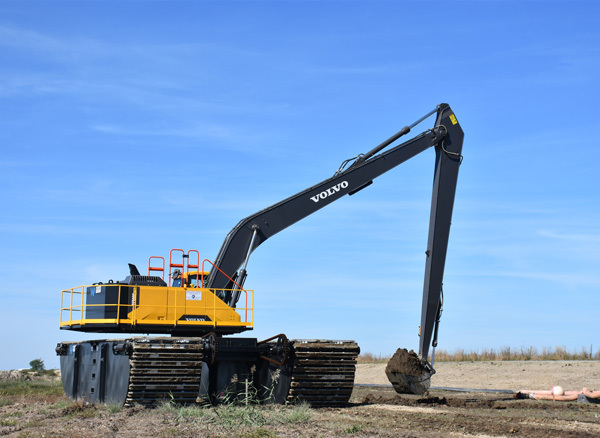 Maryland Environmental Service is using a Volvo EC300E amphibious excavator to restore Poplar Island, a once diminishing remote island habitat in the Chesapeake Bay, North America. The specially-modified Volvo EC300E amphibious excavator is able to float on soft terrain. Situated on the North Eastern Atlantic coastline of the United States, the Chesapeake Bay is the largest estuary in the country. Over the centuries, its bountiful rivers, lush wetlands and thriving forests have formed a complex ecosystem that today encompasses a plethora of habitats, supporting countless species of plants, animals and fish. However, some of the Bay’s habitats, such as wetlands, remote islands, shorelines and submerged aquatic vegetation, are in dire need of restoration. Islands are particularly at risk; once many in number, few remain to this day due to a variety of natural processes, largely erosion. Poplar Island, located 55 km (34 mi) south of Baltimore, Maryland, is a prime example. According to a survey taken in 1847, the recorded size was 461 hectares (1,140 acres), but by the 1990s, the land mass was no larger than two hectares (five acres). The complete disappearance of the island seemed imminent. However, today Poplar Island is a national model of environmental restoration thanks to the Poplar Island Project Team, made up of the US Army Corps of Engineers (USACE) Baltimore District and Maryland Department of Transportation’s Port Administration (MPA). 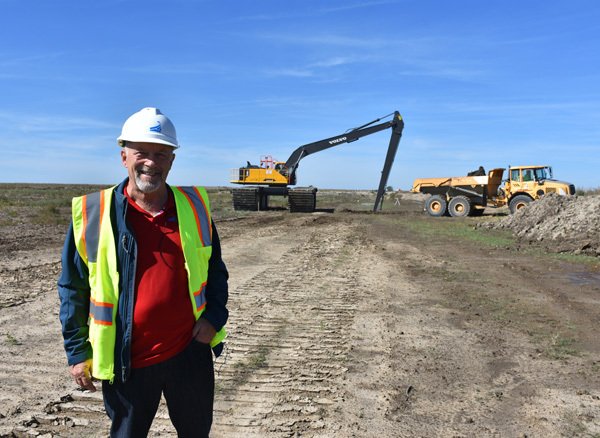 For nearly two decades, the team has used dredged material from the shipping channels that lead to the Port of Baltimore to rebuild Poplar Island and keep the channels open. In addition to restoring Poplar Island to its 1847 footprint, a 233-hectare (575-acre) expansion is underway. When complete, the total size will be 694 hectares (1,715 acres) – 50% larger than its original size. Part of the project involves restoring the island’s natural habitats to preserve the Bay’s rich ecosystem for the future. To do that, MPA has brought on board Maryland Environmental Service (MES), an independent state agency. 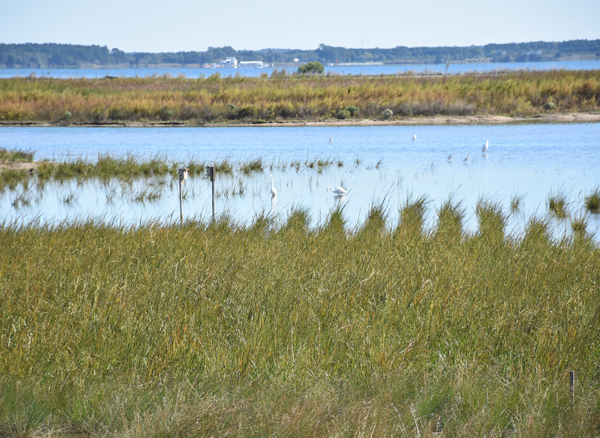 MES is responsible for constructing two habitats: tidal wetlands and uplands, both of which are in keeping with the surrounding Bay watershed. Poplar Island receives between 1.5 to 2.3 million cubic meters (2 to 3 million yd3) of dredged material per year. It has received more than 39 million cubic meters (30 million yd3) to date and will need 88 million cubic meters (68 million yd3) in total. The volume of water is a constant challenge during habitat construction. MES needed machinery that could operate in the cell without sinking into the soft earth. Enter the specially-modified EC300E amphibious excavator from Volvo Construction Equipment. In 2016, MES purchased a new Volvo EC300E excavator from local Volvo dealership McClung-Logan Equipment Company that was modified to replace the standard crawler tracks with custom flotation pads. The Volvo EC300E excavator’s standard crawler tracks were replaced with custom flotation pads, enabling it to operate in the cell without sinking. 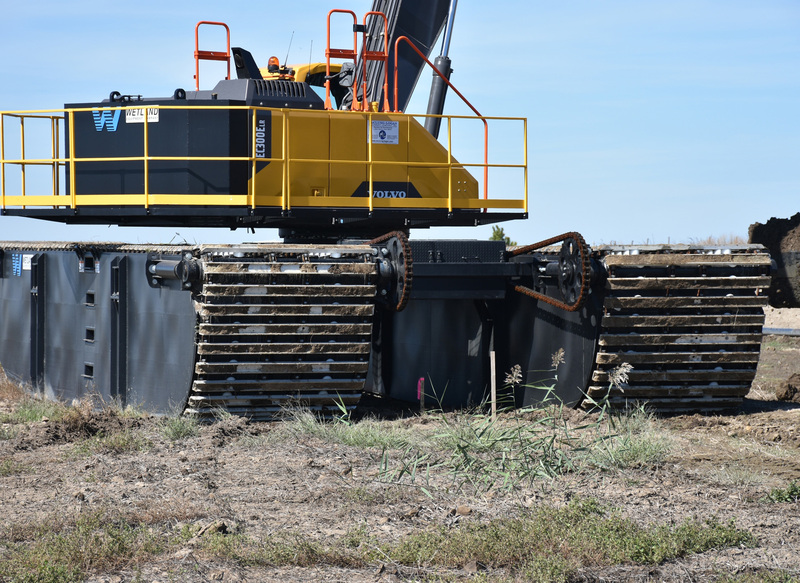 “The pads are hollow inside, and have wide and thick tracks to dissipate the down pressure, allowing the machines to effectively float on the soft terrain,” says John Mirabile, equipment fleet manager at MES. Jamie Reid, territory manager for McClung-Logan Equipment, was able to provide a faster, turnkey solution for MES by working directly with a pontoon supplier. “Volvo shipped the EC300E upper-carriage directly to our third-party vendor in Louisiana, where they were to build-fit everything from the ring gear below. That gave them an opportunity to test the complete assembly before the excavator was delivered to our Baltimore dealership,” he says. Jason Doty, an experienced MES equipment operator, is impressed with the EC300E’s performance. “The cab has plenty of room, the hydraulics are very quick and smooth, and the engine has a lot of power,” he says. John Mirabile, equipment fleet manager at the Maryland Environmental Service is pleased with the Volvo machines’ performance. MES uses up to six Volvo A25 articulated haulers (including the latest G-series) at any given time, depending on the task at hand. Common jobs include shifting the dredged materials and moving sand from the staging areas to the dike areas. The machines are now in non-stop use around the island and making the heavy-duty work feel a little lighter. With a fifth of Poplar Island’s habitat already restored, scores of the Chesapeake Bay’s most sensitive bird species are already returning to nest, as are many diamondback terrapin, which are native to the region. The project has also gained international attention, with delegations and tourists from all over the world visiting the Bay each year. Many of the Chesapeake Bay’s most sensitive bird species are already returning to nest.